Sounds of cars driving by, someone (probably one of your kids) talking, thoughts in your head… There are so many things that can distract us when we want to meditate. It’s SO easy to be distracted! Accept the distraction - Whatever it is that you’re distracted by, accept it. Don’t fight it. It’s normal to get distracted and fighting it will make it worse. Sounds will always be there and so will thoughts. We have about 50.000 thoughts a day! Can you imagine?! It’s normal they distract you. Use the distraction to meditate - What?! Yes, you can totally use the distraction to meditate. Although I wouldn’t use your thoughts for that. Sounds can be really helpful when it comes to meditating. The sound of cars driving by, or the lovely sound of the birds outside, the ticking of the clock… When you focus on those things, you will be focusing on something else than your thoughts and your mind will become calmer. Listen to calming music - Listening to music can help you calm your mind. When you’re focusing on the music, you won’t be focusing on your thoughts and you won’t be hearing other distracting sounds. Yes, listening to music is also a distraction, but it’s a lovely one and can really help you relax. Listen to a guided meditation - Listening to someone taking you into a visualization can help you forget everything around you. Go back to your meditation - Every time you get distracted, go back to your meditation. Be glad you noticed it, accept it, and focus on your meditation again. Now what about this scary part of meditation? Maybe you don’t even want to meditate anymore! Relax… It’s not going to be THAT scary! It’s just your unconscious mind trying to protect you from something that MIGHT be scary. I’ve never experienced anything scary when meditating. And meditation did bring me lots of things! Mostly feeling more relaxed (something I could really use!) and having more energy. Meditation is really worth trying! 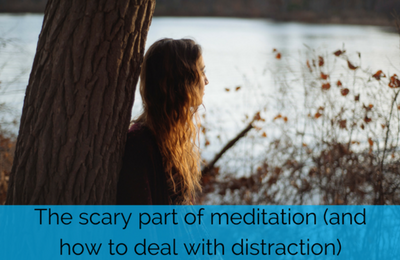 Next time you would like to meditate, don’t worry about the distractions. And don’t be too hard on yourself. Distractions will most likely always be there. When you notice you get distracted, forgive yourself and go back to your meditation. Even if you have to do it several times during your meditation. Keep practicing, you will get better! I know you can do it! If you love guided meditations don’t forget to sign up to receive my free meditation package! And if you have any questions or would love to connect with me, please come join my free Facebook group.